I got out of work early last Friday and I was determined to maximize the ‘fun’ in the day as a result. I zipped home and had lunch with Irving and then I went to pick Adele up from daycare! She was surprised to see me in the middle of the day, but she looked pretty stoked. 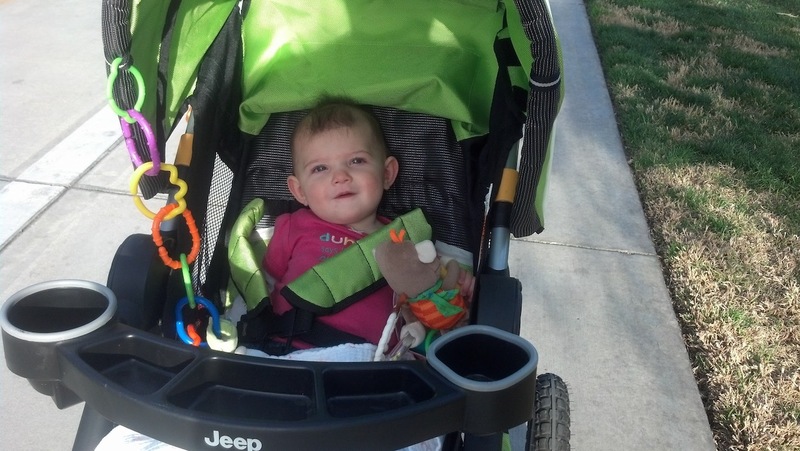 I left my car parked on the street and I strapped her into our jogging stroller and took off on a run! I ran/jogged/walked for 45 minutes. My legs felt like lead. 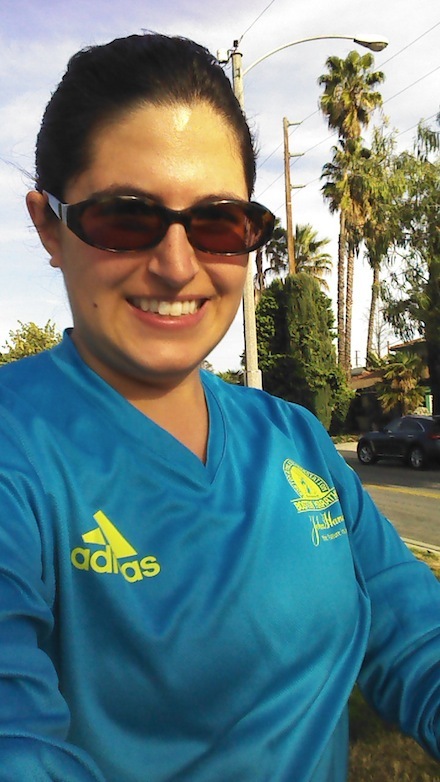 I have SO much endurance to build up before I really start half-marathon training again (next race is in November!) But I need to build my base back up to a solid 3 miles before I can dive in this summer. Adele was cheering me on with her cooing until she fell asleep. I think I covered 2.3 miles or so. Not bad for starting over. I can’t wait to turn the clocks back (ahead?) in a few weeks so I can go after work with her again. 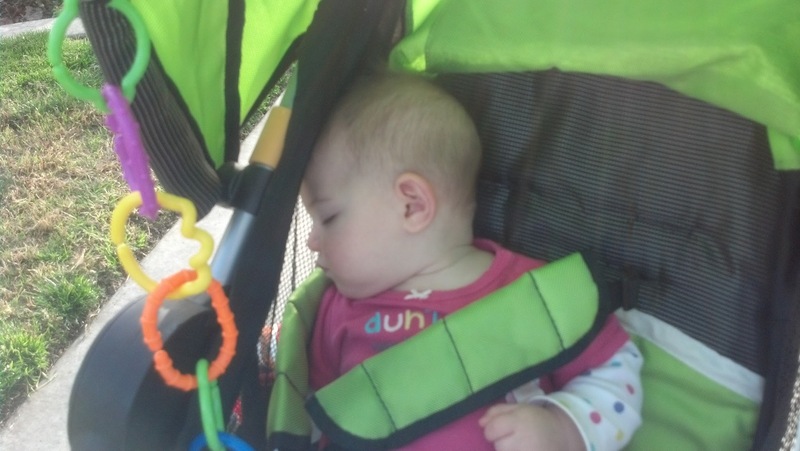 After I was done, I transferred a still-sleepy baby into the car and we headed off to the park! (I was on a mission to maximize fun, remember?) I found a cute little baby park nearby that was bustling with babies, toddlers, parents and nannies. 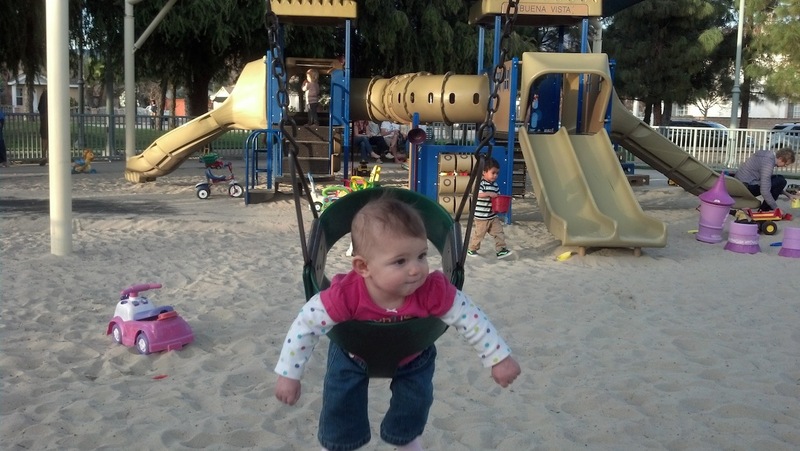 Adele loved to swing back and forth while watching other little ones running around. 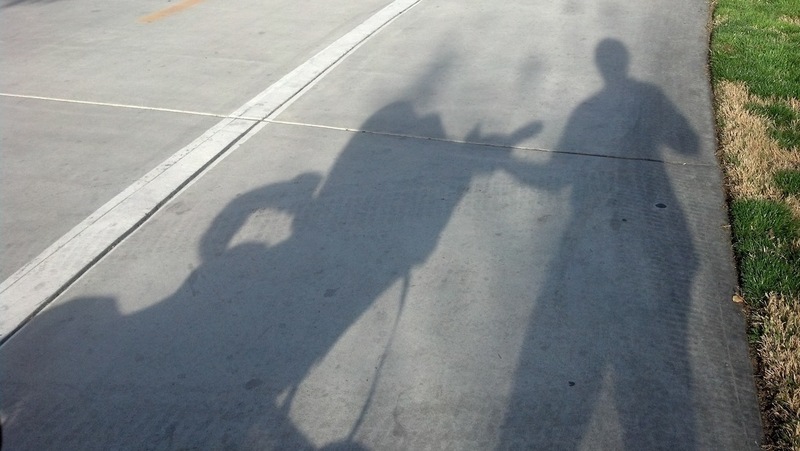 And once we were all swinged-out, we walked right on over to the library! There’s a cute little children’s room with puzzles, toys and books to play with. We sat for a half hour or so and it was awesome. My heart was so full. 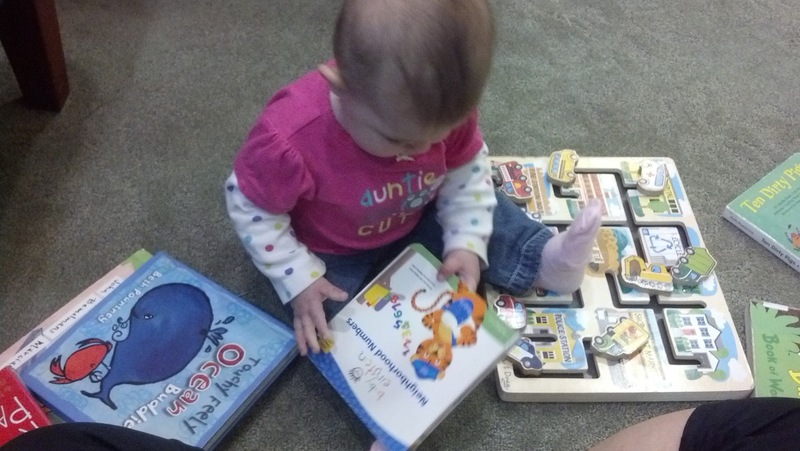 I am so excited that Adele likes books. 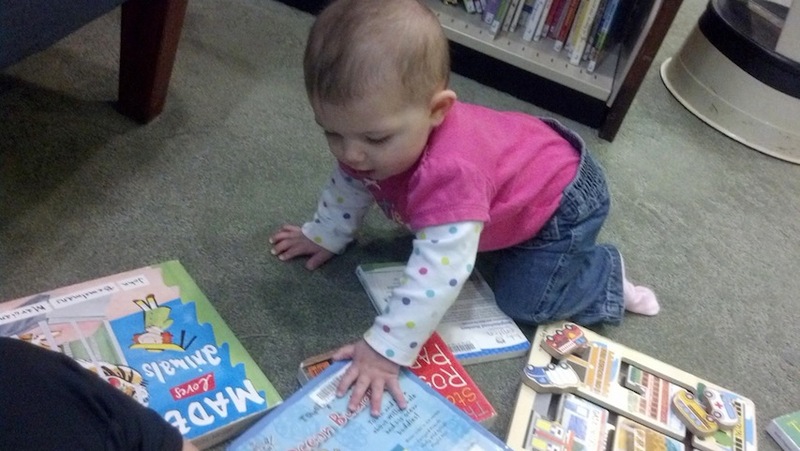 I let her crawl over to the shelf and pull off a book and then I’d read whatever she picked to her. I ended up checking four board books out of the library. Admittedly, I get a little bored with the books we have sometimes, so it’s nice to switch it up. Plus it’s an excuse to re-read all my childhood favorites too. Madeleine in Paris, anyone? And for our last adventure of the day, we went grocery shopping. 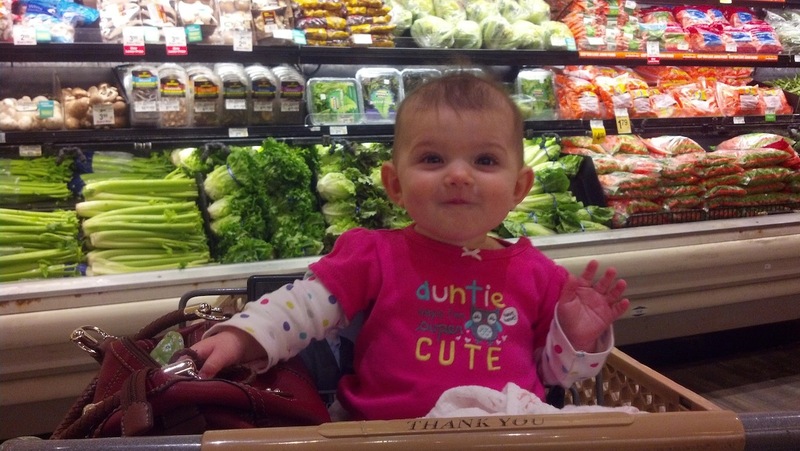 (Believe me, doing groceries does not rank high on my “Fun” list, but with this little one in tow, it actually was fun). She loves looking at colors and people, so she was pretty much in heaven. I also let her play with a bag of shredded cheese and she was excited about that too. And we did all this (a run, the park, the library and groceries) in about 3 hours. Still home in time for dinner, bath and crawling time. It is days like this where I look back and realize how fun being a mom is. Adele makes it easy on me, but I’m seriously just having a blast. For someone who checks your blog as much as I check my email… I feel like I don’t comment enough. Today I felt it was necessary to really let you know how great of a mom you are!! I can’t wait to see you guys this weekend!! !